Where is it? 250km south of Kununurra, WA. 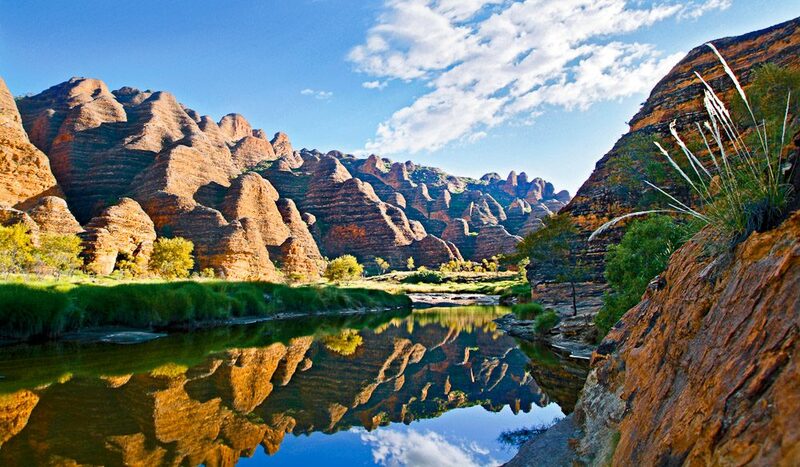 You’ll be speechless within seconds of take-off as you’re introduced to Purnululu National Park’s Bungle Bungle Range, a carved 350 million-year-old landscape of gorges and pools surrounded by a soft, green blanket of grassland. Since its discovery in the 1980s, what was once Australia’s best-kept secret is now internationally recognised as a top destination. Because most of the area is inaccessible by car or foot, the best way to appreciate the tiger-striped beehive domes is from a plane or helicopter. The huge black and orange mounds rise up to 300m, while olive-green fan palms cling to the crevices below. Flocks of native birds swoop between the gorges, tracing the long and narrow chasms and the thick skin of stripy silica and algae on the rocks. If you look really carefully, you might see gorges decorated with Indigenous rock art and filled to the brim with Dreamtime secrets. Please correct “it’s scale” to “its scale”. “it’s” means “it is”. Well caught DA. It’s fixed now. Ed.